This is a truly magical double-duty kind of recipe: The marinade for the pork and the dressing for the salad are both made from the same base, so it’s minimal work to create a healthy and tasty meal. If you’ve got selective eaters who might not be ready for the strong flavors of olives or feta cheese, serve those items on the side and let people add them at the table as they please. In a blender or food processor, combine the garlic, vinegar, olive oil, oregano, lemon zest, salt, and pepper. Blend on high speed until smooth and emulsified, about 1 minute. Pour off 1 cup of the marinade and set aside. Add the rosemary to the the marinade left in the blender and blend again, until smooth. Toss the eggplant cubes with 1/4 cup of the rosemary marinade. In a separate dish, pour the remaining rosemary marinade over the pork chops and toss to coat. Allow the eggplant and pork to marinate, refrigerated, for a minimum of 1 hour and up to 12 hours. Add the lemon juice and honey to the cup of reserved marinade you originally set aside. Whisk vigorously to combine. This will become the dressing for the salad. Grill the eggplant cubes and pork chops on a preheated grill; the eggplant should only be cooked until slightly softened and browned on all sides. The pork should cook for 5-7 minutes per side. Allow the pork chops to rest for 10 minutes after cooking. To assemble the salad, toss the grilled eggplant cubes with the lettuce, tomato, cucumber, and bell peppers in a large bowl. Gradually add the salad dressing, tossing gently, until the salad is dressed to your liking (start with 1/4 cup of dressing and add more only as needed). Top with the olives and feta cheese. 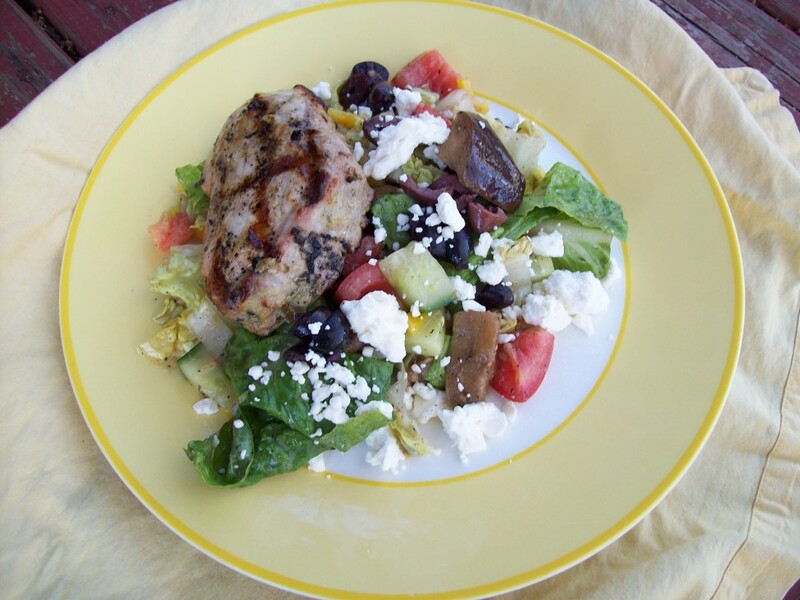 Serve the salad with the grilled pork chops.